Why Support Therapy and Spirituality? What is the Work and its Purpose? Can I Choose What to Support? Can I Support in Other Ways than with Money? Inner work, therapy and personal healing are not selfish pursuits. The way of awareness and awakening is sincerely and genuinely engaged in only by those with inner power, courage and innate compassion. These and other noble human qualities are stirred, cultivated, grown and awakened within before they can be brought to bear authentically on outward relationships. The therapist is often like a skilled midwife whose ability to observe the signs of the birth process enables her to stand alongside, lending support, care, confidence and courage, often without intervening in any obvious way. When the second birth takes place, the individual enters a stream of change and transformation, love and compassion, caring and real concern, and the ability to be effective in demonstrating that concern, that puts all previous attempts at love or help into true perspective. Reserve and confidentiality forbid my sharing with you the amount of compassionate work people in therapy with me have performed in the world, but it is contemporaneous with the depth of their personal healing. At first the person closest and dearest to them benefits through being touched by the transformed state of their mate, spouse or companion. Second, the immediate family is touched. Third, their wider circle of friends. Fourth, their acquaintances. Each time a further circle is reached, each individual affected positively in turn affects several more and each individual thus affected affects more in their circles, spiraling outward in an increasing ripple affect. Just like the toxic effects of hate and anger, the positive, healing effects of love and kindness can be felt by the sensitive and the kind. The genuine awakening of even one single individual has immense significance for inner and outer peace, and the enlightenment of all. My work is a response to the deep need in people to awaken to authenticity and compassion. The self-contracting, self-serving complex of ego processes must be transcended for an individual to be fulfilled, satisfied, heart-centered and happy. The individual must be willing to look deeply inside before genuine selflessness is possible. As individuals awaken to the truth, intelligence, contentment and wisdom of their real nature, the inner condition of collective humanity becomes reflected in the outer world—and the outside world transforms. 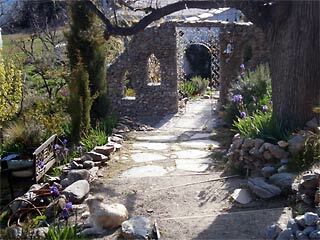 Therapy and Spirituality provides a program of workshops, courses, trainings and retreats based at Cortijo Llano de Manzano in Andalucia, southern Spain, which is the home of its founder and director Richard Harvey. Richard also maintains an international psychotherapy practice for individual therapy, couples counseling and spiritual guidance in person, or by Skype. Alleviating the distress and dis-ease from imbalanced emotional conditions that stem from the human predicament in modern life: stress, coping with emotions like anger, sadness, anxiety, depression, fear; crisis; abandonment, grief and loss; anger and violence; confusion; lethargy and lack of motivation; low self-confidence; eating problems; sexuality and gender issues; major life changes; lack of fulfillment and discontentment with life; communication and relationship problems; unhappiness; work-related issues, isolation and aloneness. This is called counseling or therapy. This is initiated by some form of existential crisis or existential dissatisfaction. Present life circumstances like relationships, family, work, finances and sexuality, a sense of meaning, illness and health are all considered holistically as the gestalt of an individual life, with a specific purpose and potential for radical change and freedom from the conditioned patterns and behavior. This deep process leads to transformation and the authentic life in which the true nature is revealed and lived. This is sometimes called depth psychotherapy. This is about an encounter with the divine in everyday life, involving spiritual guidance, encouragement, skillful instruction and relationship. Spiritual practices: breathing, meditation, contemplation, study, attention and being and awareness exercises. Usually initiated by divine longing, the need for a spiritual path that works, a deep dissatisfaction with the world or existential crisis. This is spiritual guidance and spiritual mentoring. This is for people who may already be practitioners in the healing field and wish to incorporate and use the principles of Richard’s model of threefold human awakening: Self-Discovery, Personal Authenticity and Spiritual Transcendence, through training workshops, seminars and online courses, using practical and philosophical models. This is psycho-spiritual training. In addition, Therapy and Spirituality supplies books by Richard Harvey, free downloads, a regularly updated list of articles on psychotherapy and spirituality, a free Q & A service, and free online video talks. Although charges are made for the group program and therapy sessions much of Richard’s time is spent in service, answering people’s queries, offering advice, encouragement and counseling over the internet via email, writing articles and books to impart new ideas about personal enlightenment and working free or at a reduced fee with people who otherwise would not be able to afford counseling, psychotherapy or spiritual guidance. He also offers a free talk to any interested group. In recognition of this, many people over the years have made donations, offering financial help and much-needed material resources to support Richard’s work. Improving facilities for the Center at Cortijo Llano de Manzano: the Mountain Yurt, the retreat accommodation and workshop facilities, including a bathroom, cloakroom and dining area (a full list of much needed improvements is available on request). Subsidizing Therapy and Spirituality to enable people seeking therapy and spiritual guidance to see Richard or his students when they cannot afford to pay the full cost. Preference is given to women who are unable to support themselves due to societal restraints, being single-parent mothers, victims of domestic violence, or who are simply unable to afford therapy when they are in need and/or particularly motivated toward self-enquiry. Becoming a Patron of Richard’s Writing to enable Richard to have time to write and establish a body of work that addresses the needs of spirituality and personal liberation today. Those who have felt the authenticity of Richard’s teaching may see that arguably this addresses an urgent need. Yes, two new and exciting projects are in the realms of vision, imagination and occasional discussion. They may be realized by motivated and inspired people who could offer enthusiasm, skills and time to the projects. The Center for Human Awakening—an organization whose aim is to further the work of Richard Harvey and Therapy and Spirituality. Dedicated to the practice and development of The Three Stages of Human Awakening, possibly a global organization with centers in Spain and other countries overseen by an international core group of diverse and experienced practitioners in the psycho-spiritual field. The Arhat Project—a residential spiritual community where the processes of personal inner enquiry and transformation are accelerated through a semi-monastic but engaged schedule and life style. Based on the practices inherent in The Three Stages of Awakening, a communal living project where personal and spiritual development is accelerated, intensified and potentized. If you would like to become involved in either of these projects, please write via our contact form on this site. Please visit our	 to make a donation in euros only using our secure Paypal facility, via either your credit card or Paypal account. Please tell us if you would like to be openly acknowledged at the center, in promotional and illustrative, descriptive literature and publications, or simply remain anonymous. Please note that Therapy and Spirituality is not a registered not-for-profit or charitable organization at this time. Therefore, we will not be able to provide you with a receipt for taxation purposes. If you know someone who would like to receive Therapy and Spirituality mailings, or who you think may be interested in making a donation please forward the appropriate link. It is truly a blessing to witness anyone share their gifts with the world; and this is precisely what Richard Harvey does—he shares his gifts of understanding the symbiotic nature and relationship between the mind and the soul. Like no other professional I am aware of, Richard blends traditional psychotherapy with spiritual companionship and stewardship to authentically and compassionately accompany aspirants through their healing journey. Your donation to Richard’s work on Therapy and Spirituality will help support the healing journey of those precious souls who seek true inner peace. Richard devotes his compassion and understanding to the success of Therapy and Spirituality. The key to the continual success of his organization is by your support financially. To keep this positive energy flowing through the growth and commitment of Richard’s groups, sessions, talks and inspirations that he’s so dedicated to, investing in Therapy and Spirituality, you are choosing to invest in an idea that came alive and will continue a legacy of transcendence and liberation for those ones seeking a journey of discovery. For every distress that becomes alleviated in someone's life, you offer support. Then that support helps someone who gives back to their community, then reaches out into the world. That is the impact made by your donation to Therapy and Spirituality and to a man, Mr. Richard Harvey, who gives so much of his time and energy to fuel a cause that creates this positive outcome.